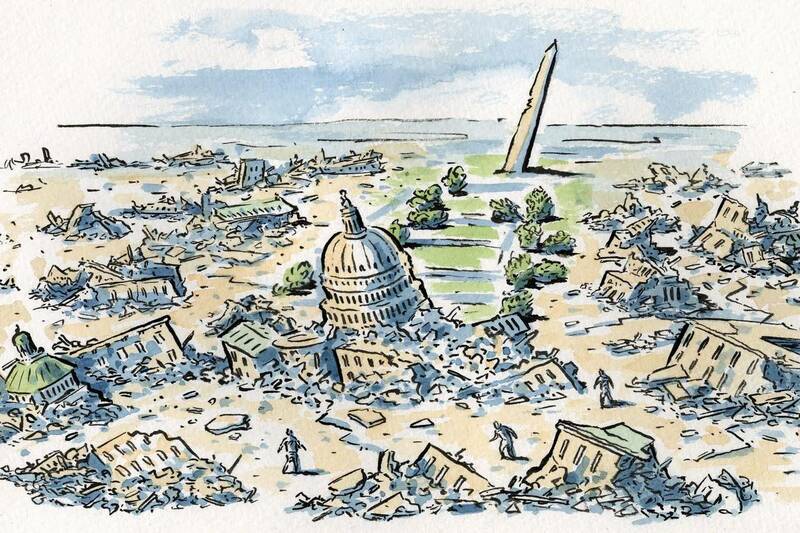 Washington Still Reels From the Quake of 2016 From the White House’s empty offices to overly giddy CPAC, everyone seems a little lost. If Democrats have a brain in their head, they’ll let Supreme Court nominee Neil Gorsuch sail through the Senate. He’s too attractive. He has been frank and respectful in his meetings with them. He’s been candid about the man who nominated him, Donald Trump, to the reported irritation of the president. He is a thinker of clear conservative leanings who cannot be painted as radical because he’s radical as warm milk. His decisions tend to be plain, direct yet highly literate; in one he diagramed a sentence. He’s a friendly persuader with a serious intellectual background (Marshall Scholar at Oxford) and personal dignity. Sharp and uniform opposition to him would look radical. Democrats should make critical or reserved speeches at the confirmation hearings next month and then softly vote yes. They should make a show of their desire to be fair, impartial, Constitution-minded. Then they should try to kill the next nomination as a bridge too far, while hiding behind the good faith they showed in accepting Judge Gorsuch. Do Senate Democrats have a brain in their heads? They do. It’s good to be Judge Gorsuch. It’s going to be bad to be the man or woman who follows him. Everyone in journalism has tried to sum up the first month of Donald Trump. The problem for all of us is that the act of defining tends to impose form on what is by nature formless. New administrations always are. This one is different only in the difficulty of getting its nominees through, and getting others to join them. Two weeks ago, walking around the Old Executive Office Building, all I could think was how empty and quiet the place seemed. My old office was shut with a big weird lock. The office across the hall had the door open and was brightly lit but was also apparently unoccupied. My impression after an afternoon in the White House complex: The lights are on but nobody’s home. It can be said of many if not most in Washington that they still have a concussed look. They’re like people after an earthquake. At some point you go out looking for water and provisions and you wind up getting lost because the ground around you has been torn up and old markers flattened. Among the lost: the American Conservative Union, whose annual Conservative Political Action Conference used to be too sober and now is too giddy. Hapless congressmen and senators being yelled at in town halls. And Speaker Paul Ryan, who Wednesday rode a horse along the Rio Grande. He meant to show skeptical conservatives he means it about border security, but he looked like someone on his way to club the serfs. Well done, mature grown-up. That was cool. An odd thing about the president—and this has contributed to the general lostness of Washington—is that he doesn’t perform a primary and obvious function of presidents, which is to argue for things. You make a decision, unveil a program, and make a case for its excellence. The other side then argues back. In the ensuing back-and-forth, voters get the contours of what’s being proposed. This president doesn’t argue, he only announces. He asserts. Previous presidents in their early speeches were always making the case for a certain advancement. Not to do so is a waste of the biggest mic in the world. The populists or economic nationalists of the Trump administration have, on some level and at the moment, swept the party. Now they’re trying to own it. But you don’t hear from them much about the meaning and content of their endeavor. And the symbolism that keeps cropping up around the White House, or rather Mar-a-Lago, is odd. In Palm Beach, Fla., cabinet members and top administration officials swept into the birthday party of Steve Schwarzman, chairman of the president’s Strategic and Policy Forum. It was black tie, lavish, with trapeze artists and “a massive fireworks display on the Intracoastal Waterway,” as Town & Country reported. Mr. Schwarzman has been admired in this space for his great generosity to Catholic education. And it’s his money, as they say. But it is odd to see such un-self-conscious excess when you’re thinking Populist New Wave. Early word on the president’s budgetary framework is also startling, and adds to the confusion. He’ll cut waste, he says. Good. Beyond that, his plans sound pretty standard Republican. But Mr. Trump didn’t campaign as a standard Republican. He didn’t stress slashing funding or forcing down the debt. It is legitimate to wonder if Republicans in Congress are trying to tug the White House more toward what used to be called green-eyeshade Republicanism—“we’re just a bunch of accountants and bean-counters”—and away from more Trumpian campaign vows such as infrastructure spending. This week Mike Allen, in his morning Axios newsletter, reported Capitol Hill is currently overstuffed with legislation, and GOP strategists say there’s a new plan to roll out a big program to rebuild roads and airports. They’ll push it off until next year. The thinking is that Democrats are likelier to back such a costly scheme closer to the midterm elections. That struck me as exactly wrong. The first year’s legislative agenda defines a new administration. Early programs stand out before everything, in the following three years, becomes a blur. Infrastructure is part of why Donald Trump was hired—he’s the builder, the magnate. It was for his supporters not a secondary but a primary issue—build something, do something. The unions and trade organizations back it, as would Americans who are nervous now whenever they go through a tunnel. Big endeavors can be promising in ways that aren’t always calculable. You can add a mentoring program to get teenagers, especially boys, off their couches and into the world of workers, especially men, who know how to do something and can teach it. That would be valuable to our culture. The Democrats will have a hard time opposing such a bill in 2018? They’ll have a hard time opposing it now. And constituents aren’t stupid. They’ll remember in ’18 what a congressman didn’t do in ’17. Anyway, one wonders if the White House is getting snookered by longtime Hill urchins, or snookering itself. Twenty-sixteen was an earthquake. The ground beneath Washington’s feet shifted. People here need to get over their shock and start recognizing the new lay of the land.